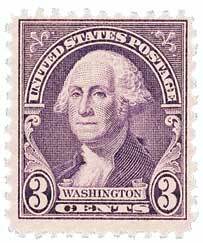 U.S. #2 – For his contributions to our nation, Washington was honored on America’s second postage stamp. Our first President, George Washington, was born on February 22, 1732, in Westmoreland County, Virginia. 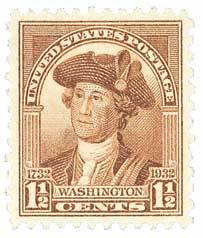 Washington’s father died when he was young, halting his plans to study abroad. George’s older half-brother and mentor, Lawrence, took him under his wing and taught him how to farm and survey land. In 1749, George joined a party that explored and surveyed the land west of the Blue Ridge Mountains. 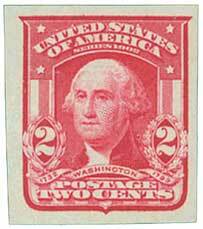 U.S. #72 – was often used on mail to foreign nations during the Civil War. After Lawrence died in 1752, Washington assumed his role as district adjunct in the Virginia militia and achieved the rank of major by the age of 20. Washington trained the colonial militia for two years before the French and Indian War escalated. Sent to the Ohio River Valley to represent British interests, Washington was involved in the opening shots of the war. Washington resigned in protest of British indifference to colonists’ contributions. As one of the state’s wealthiest landowners and a hero of the French and Indian Wars, Washington was appointed to Virginia’s House of Burgesses in 1758. The House stood fast against the Stamp Act of 1765 and other oppressive tax measures proposed by British Parliament. Along with Patrick Henry and Thomas Jefferson, Washington called for a boycott of British goods entering the colonies. The men would later be Virginia’s representatives to the First Continental Congress. 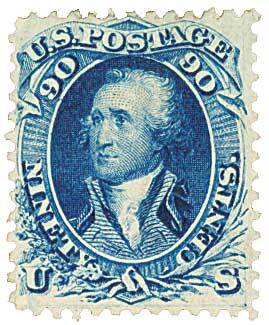 U.S. #320 – Click the image to read the neat story behind this stamp’s creation. The First Continental Congress closed in the fall of 1774 with plans to hold a second in the spring. 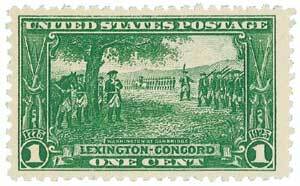 Before the Second Continental Congress convened, colonists skirmished with the British in Lexington and Concord. Washington arrived at the Second Continental Congress in full military uniform to signal his intentions, and was selected to be the commander-in-chief of the Continental Army. Washington took command of the estimated 14,500-member Continental Army in Massachusetts in July of 1775 and broke the British siege of Boston. Short on troops, and aware that he could not win by using traditional military methods, Washington relied on the methods he’d learned fighting with Native Americans during the French and Indian War. His strategy harassed the much larger, better-equipped British army through a series of surprise attacks, intentional retreats, and other guerrilla tactics. Washington scored major victories at Trenton and Princeton, before his winter at Valley Forge. He later led his men to an important victory at Yorktown. U.S. #617 pictures Washington at Cambridge. Washington resigned his commission as commander-in-chief on December 23, 1783, and looked forward to a quiet retirement with his family at his plantation. However, in 1787, he was called upon to serve as president of the Constitutional Convention. As debate raged between the 55 delegates, Washington’s leadership kept the men on course, and his support convinced many state legislatures to ratify the Constitution. Among the issues addressed by the Constitutional Convention was the office of a President to head the stronger central government. The delegates defined the office with Washington in mind. The Electoral College elected George Washington as our nation’s first President in 1789. The vote was unanimous, as it would be again in 1792, a feat that has never been duplicated in American history. His salary was $25,000, an enormous sum for that time, and one that Washington tried to decline. Washington was eventually persuaded by the argument that unpaid service would set the dangerous precedent of only allowing wealthy individuals to serve in the nation’s highest office. On April 30, 1789, George Washington was sworn in as the first President of the United States. U.S. #706 features a portrait by Charles Willson Peale. In 1793, a war was raging between England, Spain, Prussia, and the newly independent French Republic. Washington signed a neutrality proclamation on April 22, 1793. Although the United States remained neutral in the European conflict, relations with England gradually worsened. To try to repair the wounded relations, Washington sent Chief Justice John Jay to England to work out a treaty. The Jay Treaty stated that British troops would surrender their forts in America and made provisions for future trade between the two countries. Several treaties followed in the coming months. First, an agreement was reached with Spain to open the Mississippi River for U.S. trade. The Barbary Pirates agreed to release American prisoners and stop way-laying U.S. vessels for a ransom of $642,500 and an annual payment of $21,600. In addition, a peace treaty was signed with the frontier Indians. U.S. #720 pictures the same Washington portrait that appears on the $1 bill. In 1797, following his second term, Washington retired to his home at Mount Vernon. He had served his country for 45 of his 67 years. His farewell address is considered one of the most influential statements of American government values. In it, Washington stressed the importance of national unity, the value of the Constitution and the rule of law, warned against foreign influence in domestic affairs and bipartisan politics. Washington also expressed hope that the United States would entertain peaceful and prosperous relations with other nations, but warned against American involvement in European wars and long-term alliances with foreign countries. 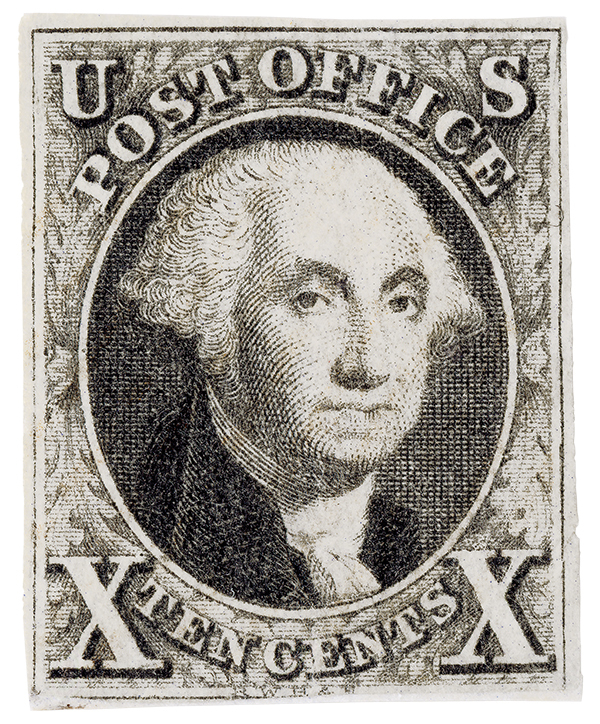 Washington’s farewell address was heeded throughout the 19th century and well into the 20th. In fact, the United States declined to sign a treaty of alliance with a foreign nation until the 1949 formation of NATO. Washington died at his Mount Vernon home on December 14, 1799. His final words were “Tis well.” He was posthumously appointed to the highest rank of General of the Armies of the United States. The Joint Congressional Resolution, which was approved by President Gerald Ford during the 1976 Bicentennial celebrations, assures that no officer of the American military will ever outrank George Washington. 15 Responses to "This Day in History… February 22, 1732"
A slight correction. Washington warned against “partisan” politics, not “bipartisan” politics. Really enjoy the daily history lesions! We need to get our current politicians to read Washington’s farewell address, especially the part about “partisan” politects. An admirable job of condensation by Mystic touching the highlights that were chosen. The article makes me want to dig into my oft read library of our founding father for renewal purposes. He had the blueprint along with his constituency for the greatest country. Good information on our first President. Excellent article. Good information that schools should be teaching today in history classes. Mystic, you done good! Excellent article for a great man! Funny how this has happened anyhow. When was the last time, if ever has there been a true Poor or Working Class citizen been elected as President. General Pershing was a General of the Armies in 1918 and is a rank higher than a 5-star general. Hmmmm.. Seems the U.S. may have set a precedent for paying terrorists for today’s military prisoners and kidnapped U.S. citizens? Example: 5 Guantanamo Detainees Being Released in Exchange for Sgt. Bergdahl. I watched 60 minutes last night and it seemed to state that the current U.S. policy is not to pay ransom demands? “If that is the case, it seems like a policy except when it is not a policy.” ?? I agree with Noah. This type of history should be taught in our schools today. I recommend that those of you that are reading this put a visit to Mount Vernon on your “bucket list”. They have done sooooo much to preserve Washington’s history. In Regards to “The Boycott of British Goods” during the stamps act…..Today’s America could learn from that. We as United Americans, Should Buy Goods Made and Manufactured In America. Thusly, WILL Make America Strong Again! Sometimes paying a little more means saving and/or growing American Jobs. That for which we pay it forward for the greater good. Couldn’t agree more. Buy American! He and Abe should still have their own separate holidays as they did when I was a kid. They are the 2 who made the USA. Happy Birthday, President Washington! Thanks for everything! I love this country!